Click Register Now button below for available dates. Watch, learn and participate with your very own glass mug making experience in the Morean Glass Studio! Gather a group of friends and sign up together or register on your own. 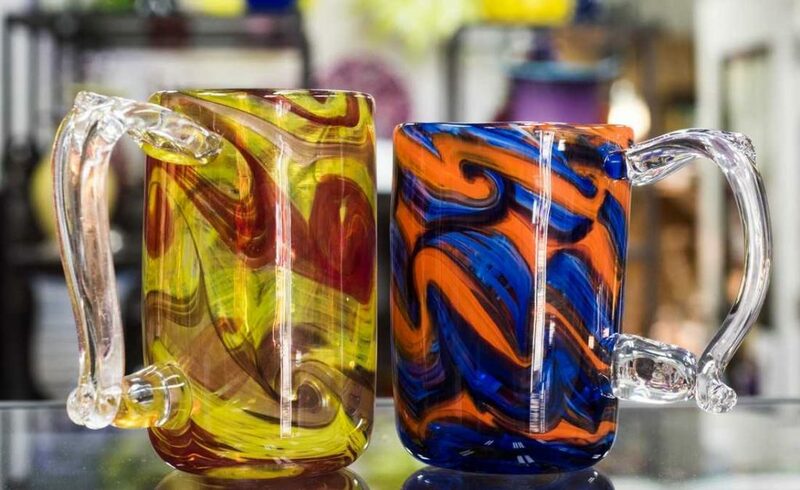 Limited to 4 people per night, this event runs from 6pm-9pm, with each participant given enough one-on-one time with a professional glass artist to create a unique personal mug. Choose your own colors, lay out the colored frit (granulated glass) in the desired pattern on the marver (flat steel surface). Then, with the assistance of a professional gaffer (glassblower) gather up molten glass, adhere the color, then heat, shape, and blow your own mug. Perfect for yourself OR as a gift! PLEASE NOTE: Pieces will need to cool in our annealer for 48 hours; once they reach room temperature, they are yours to keep: pick-up (free) or delivery (for a delivery fee) available. All pieces must be picked up within 30 days of pick-up notification. Tim Soluna was born in Carbondale, Ill., in 1985, where he developed an interest in the arts at an early age. He began working with molten glass at the age of 17 and fell in love with the unique medium — captivated by the material’s transformation from solid to liquid and the complex dance of the glassblowing process. After high school. Soluna attended Southern Illinois University where he pursued his interest in fine arts. In 2009, he received a scholarship to attend Pilchuck Glass School’s summer intensive learning from Tom Rowney, studying the creation of intricate glass pattern canes and their application in making delicate goblets. In 2010, he graduated from SIU with a BFA specializing in glass art. Since graduation, he has worked in glass studios in Illinois, Oregon and Florida. The Morean Arts Center offers many unique classes and workshops for people of all ages. Programs are affordable and allow hands-on experiences with professional artists. As a community-based visual arts organization that has been a part of the St. Petersburg cultural landscape since 1917, the Morean Arts Center connects people with art through daily programming, offered 363 days each year.